LOGO! 0BA7 supports SIMATIC S7 Ethernet communication via TCP/IP. Introduction One LOGO! 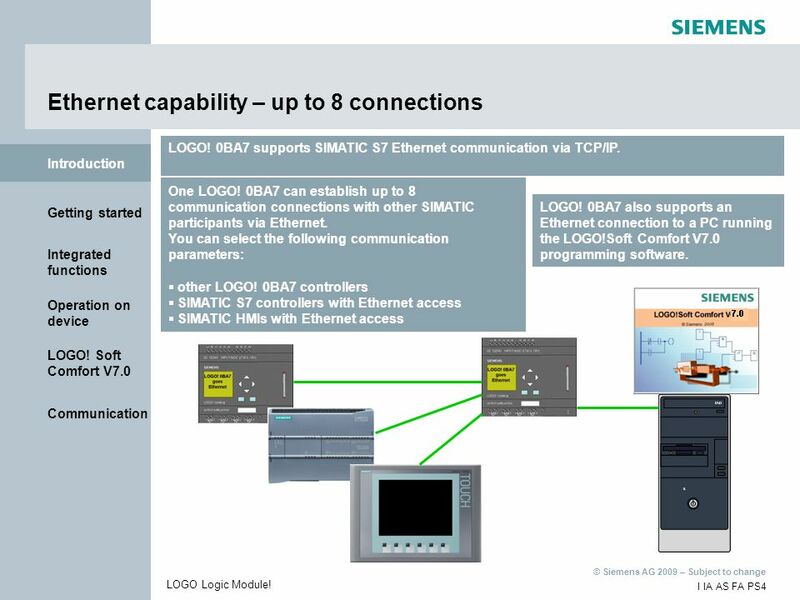 0BA7 can establish up to 8 communication connections with other SIMATIC participants via Ethernet. You can select the following communication parameters: other LOGO! 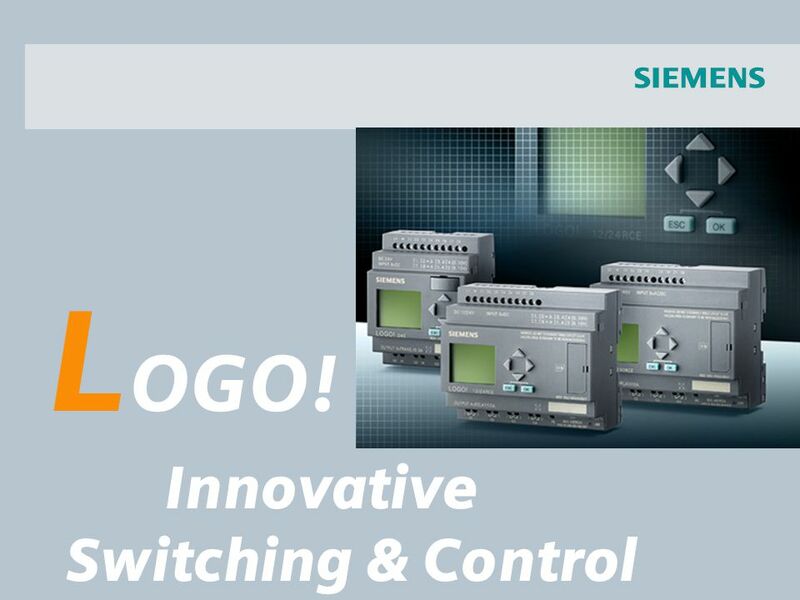 0BA7 controllers SIMATIC S7 controllers with Ethernet access SIMATIC HMIs with Ethernet access LOGO! 0BA7 also supports an Ethernet connection to a PC running the LOGO!Soft Comfort V7.0 programming software. LOGO Logic Module! 3 How do I install the USB Ethernet adapter? Plug the USB Ethernet adapter into a USB port of your PC. Insert the enclosed driver CD-ROM into the CD-ROM drive of your computer. The Found New Hardware Wizard opens. Select the Recommended installation and click Next >. The required driver for your operating system is selected automatically. Click Next >. After installing the driver, close the Found New Hardware Wizard by clicking on Finish. Getting started LOGO Logic Module! 4 How do I set up the communication between my PC and the LOGO! 0BA7? Connect the LOGO! 0BA7 to the functional ground. Use an RJ45 Ethernet cable to connect LOGO! 0BA7 to the network card to be used (e.g. USB Ethernet adapter). This requires that the network card has been installed correctly (administrator rights required!) – (observe the manufacturer‘s installation instructions!). LOGO! 0BA7 features a connection status LED (LINK) and a send and receive LED (Rx/Tx) to verify the communication status. Getting started Functional ground RJ45 Ethernet cable Link status LED LOGO Logic Module! With the LOGO! 0BA7 in Stop mode, navigate to the Network menu item. Here you find the settings of the IP address, the subnet mask and the gateway. Use the OK button to enter the editing mode of the network settings. Customize the network settings as desired. >Program.. Card.. Setup.. Start Getting started >Network.. Diagnostic.. >IP address Set mode 1 IP address OK Editing mode 2 Subnet mask OK Editing mode 3 Gateway OK Editing mode LOGO Logic Module! In Windows click Start -> Settings -> Control Panel to access the Network Connections. 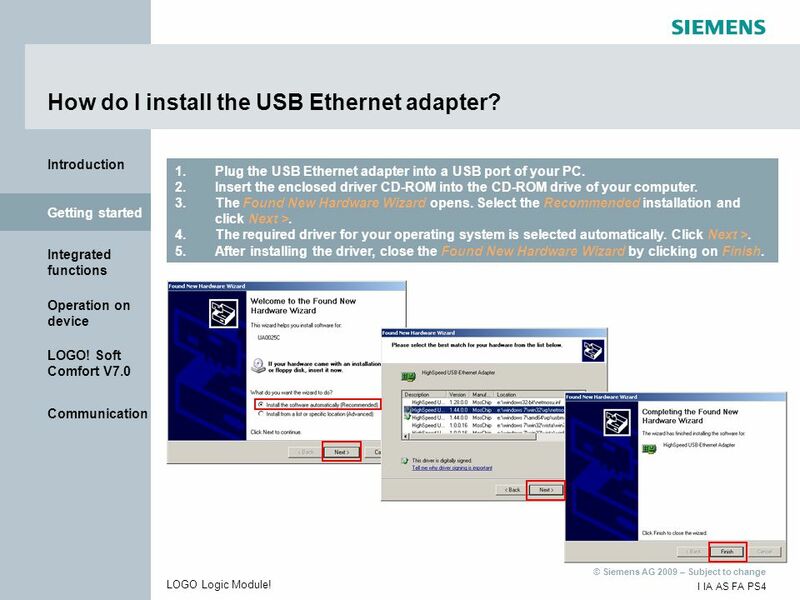 Here, select the HighSpeed USB-Ethernet Adapter and click the right mouse button to open the Properties. Open the Properties of the Internet Protocol (TCP/IP). Assign an IP address within the Subnet mask of the LOGO! 0BA7 and apply the settings by clicking on OK and Close. Getting started 1. 2. 4. 3. LOGO Logic Module! 7 Online test In LOGO!Soft Comfort open the menu item Tools -> Transfer -> Configure Network Address… . Getting started Click the Select button. Insert the IP configuration with the settings for your LOGO! 0BA7 by clicking on the Add button and confirm with OK. Click the Detect button to check the online status. The status Yes is displayed in case of availability. LOGO Logic Module! Analog network node Network node Integrated functions Analog slave output Slave output LOGO Logic Module! The “Network node” function allows you to read and process binary variables. You can call up to 64 “network nodes”. You can read either bits from the VM section of the LOGO! 0BA7 or inputs or outputs of a slave. Integrated functions To read binary variables from the VM section, enter the VB address (0 to 850) and the bit to be read. To read out the digital periphery of a slave, you have to specify the IP address of the slave, the block type (input or output) and the block number (I1 to I24 for inputs or Q1 to Q16 for outputs). LOGO Logic Module! 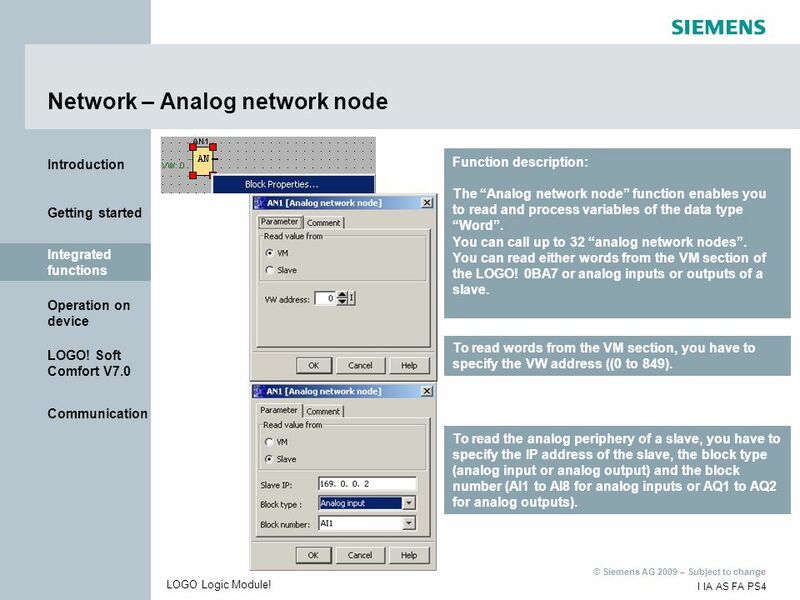 Function description: The “Analog network node” function enables you to read and process variables of the data type “Word”. You can call up to 32 “analog network nodes”. You can read either words from the VM section of the LOGO! 0BA7 or analog inputs or outputs of a slave. Integrated functions To read words from the VM section, you have to specify the VW address ((0 to 849). To read the analog periphery of a slave, you have to specify the IP address of the slave, the block type (analog input or analog output) and the block number (AI1 to AI8 for analog inputs or AQ1 to AQ2 for analog outputs). LOGO Logic Module! Function description: To describe the outputs (digital or analog) of a slave LOGO! 0BA7, use the blocks “Slave output” or “Analog slave output”. You can call up to 64 “Slave output” blocks and up to 16 “Analog slave output” blocks in one master. You have to specify the IP address of the slave and the number of the digital “Slave output” (Q1 to Q16) or “Analog slave output” (AQ1 to AQ2) to be described. Integrated functions LOGO Logic Module! Timer Analog Analog filter Astronomical clock Integrated functions Max/Min Stopwatch Average value LOGO Logic Module! The output is controlled through a configurable location. The output is active from sunrise to sunset. 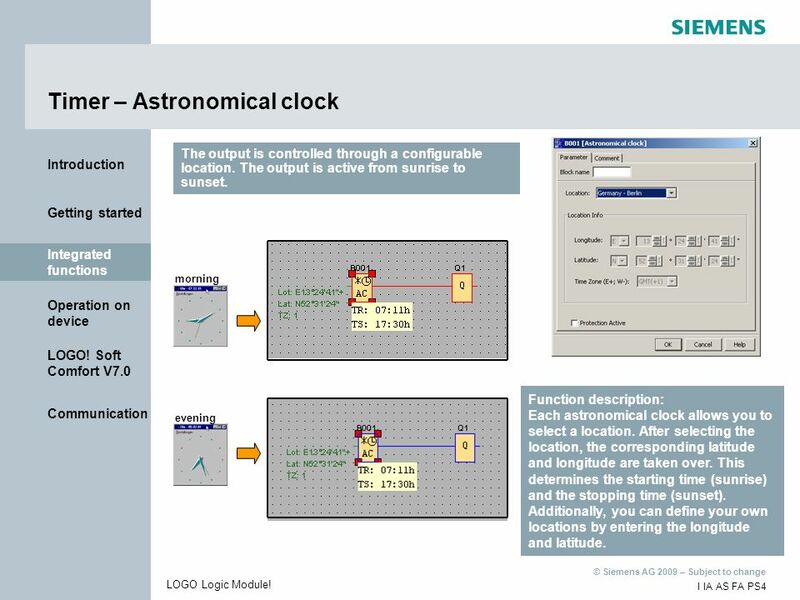 Integrated functions morning Function description: Each astronomical clock allows you to select a location. After selecting the location, the corresponding latitude and longitude are taken over. This determines the starting time (sunrise) and the stopping time (sunset). Additionally, you can define your own locations by entering the longitude and latitude. evening LOGO Logic Module! 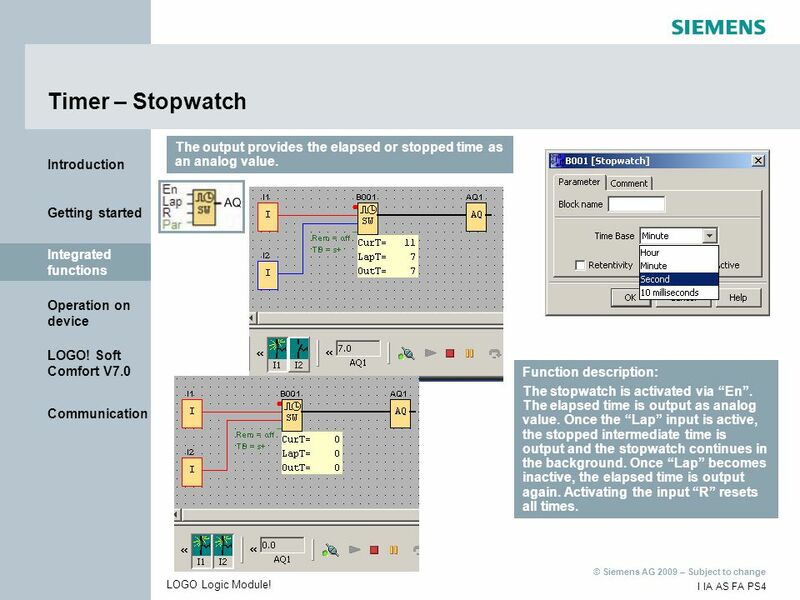 14 Timer – Stopwatch The output provides the elapsed or stopped time as an analog value. Integrated functions Function description: The stopwatch is activated via “En”. The elapsed time is output as analog value. 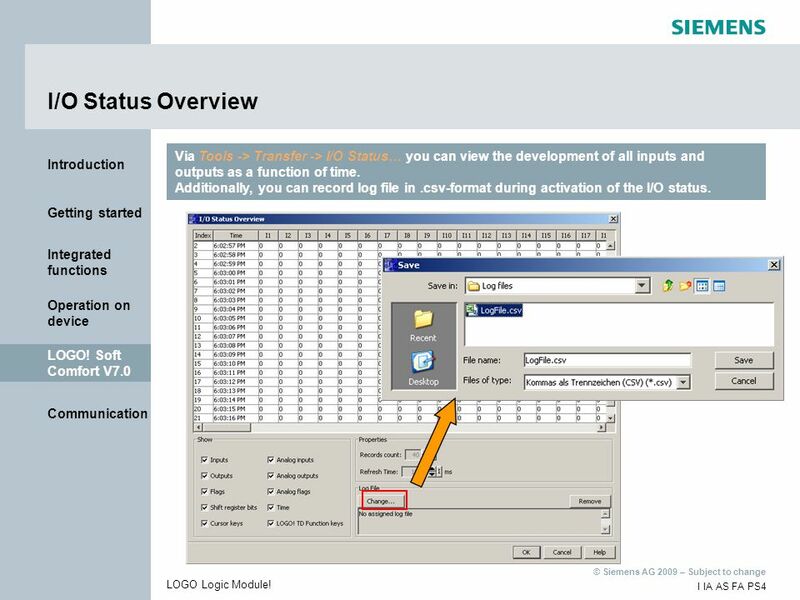 Once the “Lap” input is active, the stopped intermediate time is output and the stopwatch continues in the background. Once “Lap” becomes inactive, the elapsed time is output again. Activating the input “R” resets all times. LOGO Logic Module! The analog filter is used to smooth an analog input signal. 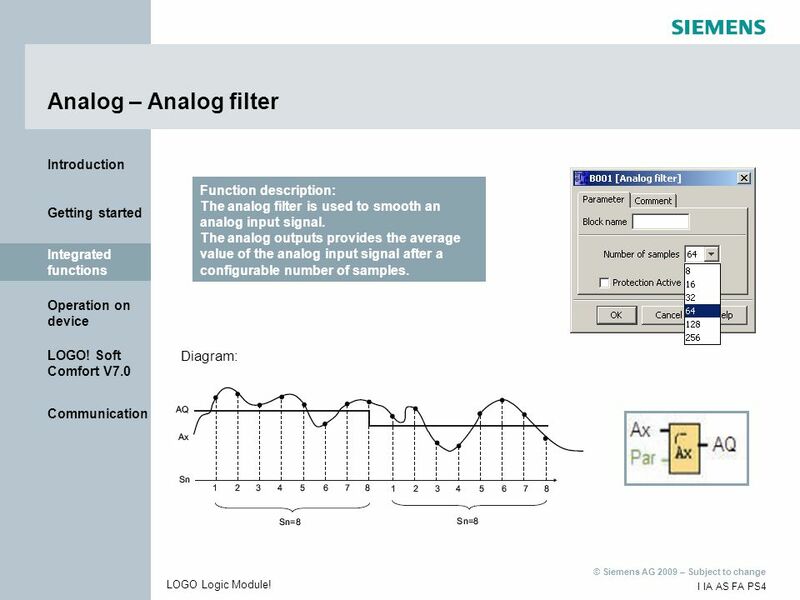 The analog outputs provides the average value of the analog input signal after a configurable number of samples. 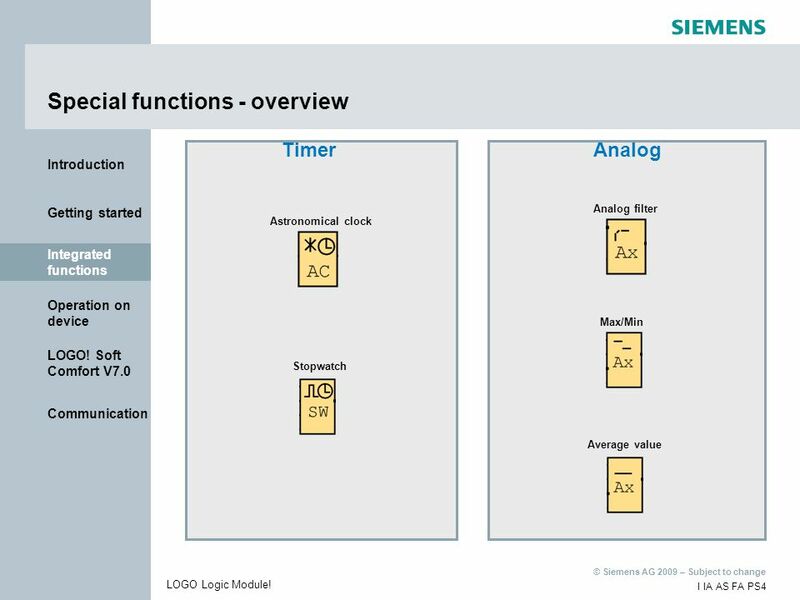 Integrated functions Diagram: LOGO Logic Module! 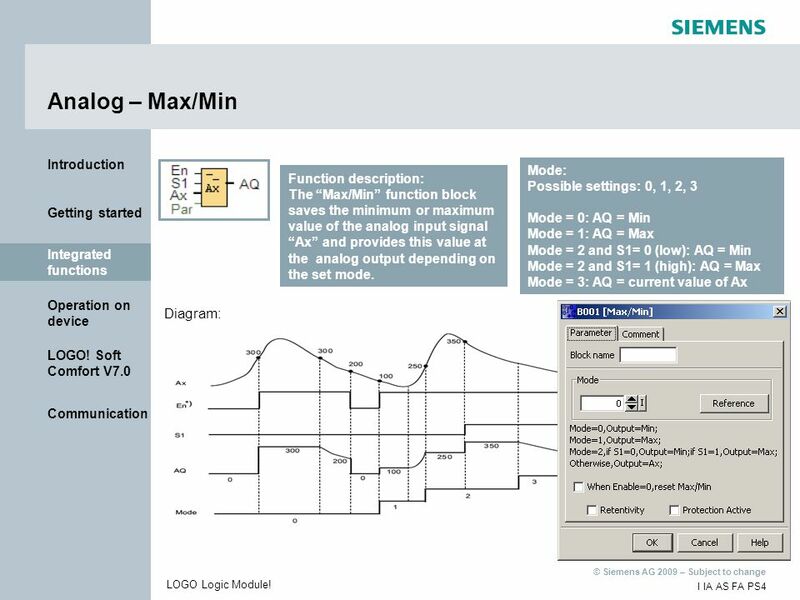 Mode = 0: AQ = Min Mode = 1: AQ = Max Mode = 2 and S1= 0 (low): AQ = Min Mode = 2 and S1= 1 (high): AQ = Max Mode = 3: AQ = current value of Ax Function description: The “Max/Min” function block saves the minimum or maximum value of the analog input signal “Ax” and provides this value at the analog output depending on the set mode. 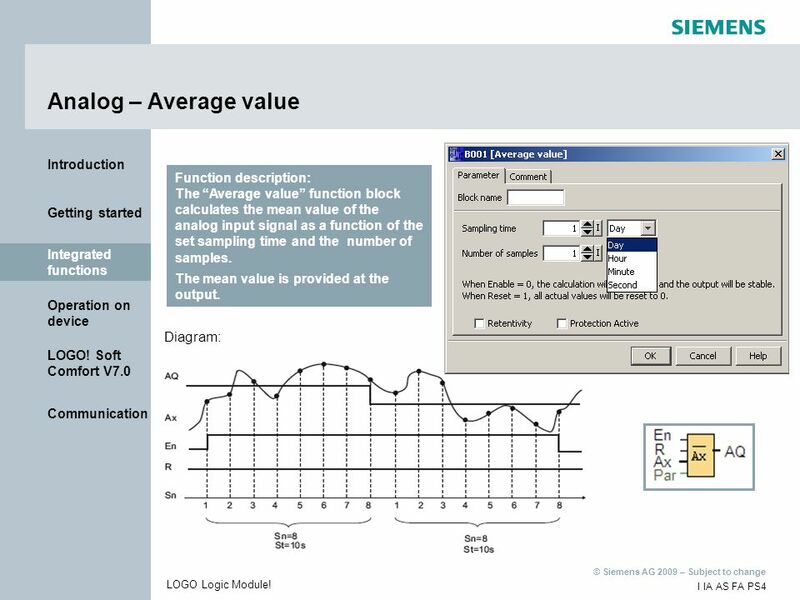 Integrated functions Diagram: LOGO Logic Module! Function description: The “Average value” function block calculates the mean value of the analog input signal as a function of the set sampling time and the number of samples. The mean value is provided at the output. 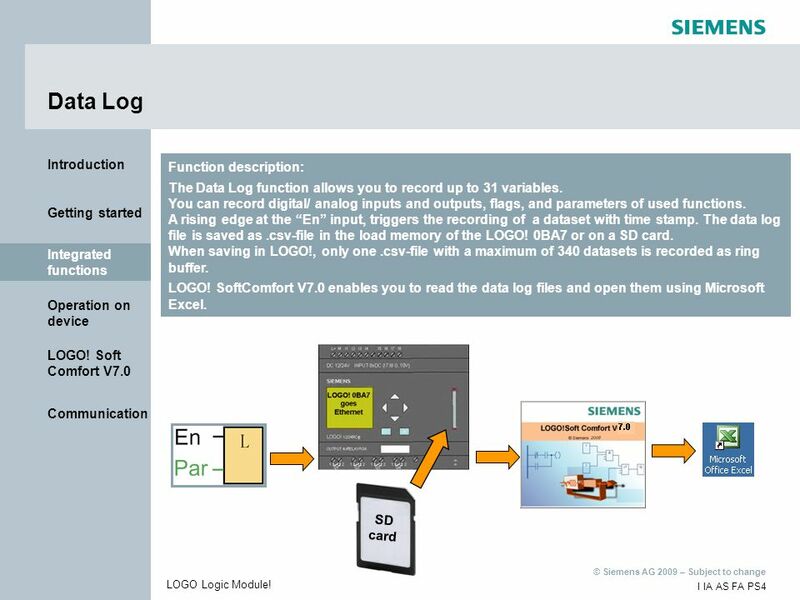 Integrated functions Diagram: LOGO Logic Module! 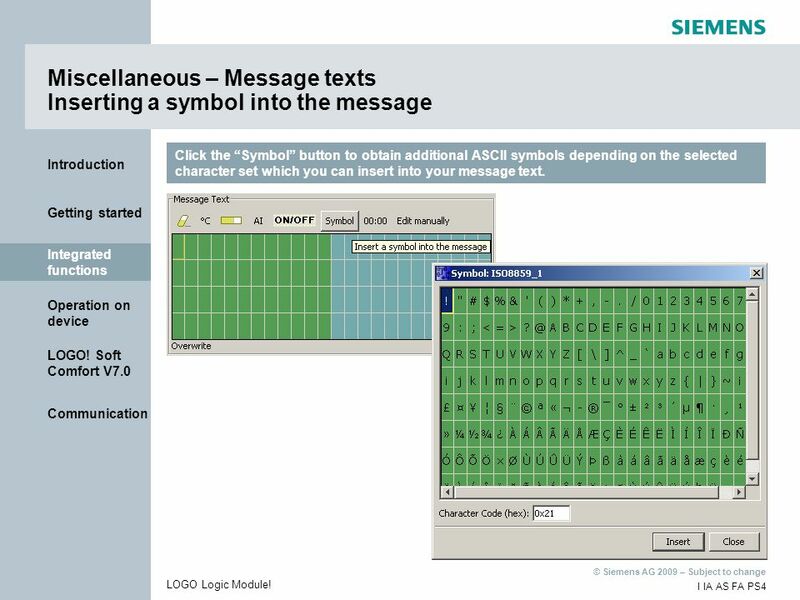 Click the “Symbol” button to obtain additional ASCII symbols depending on the selected character set which you can insert into your message text. Integrated functions LOGO Logic Module! Function description: You can select the desired shift register (1 to 4) using the shift register index. With the rising edge at the input “Trg”, the function reads the value of the input “In”. Depending on the shift direction, this value is included into the shift register bit Sx.1 or Sx.8 (x = index) : Upward shifting: Sx.1 takes on the value of the input “ In”; the previous value of Sx.1 is shifted to Sx.2; the previous value of Sx.2 is shifted to Sx.3, etc. 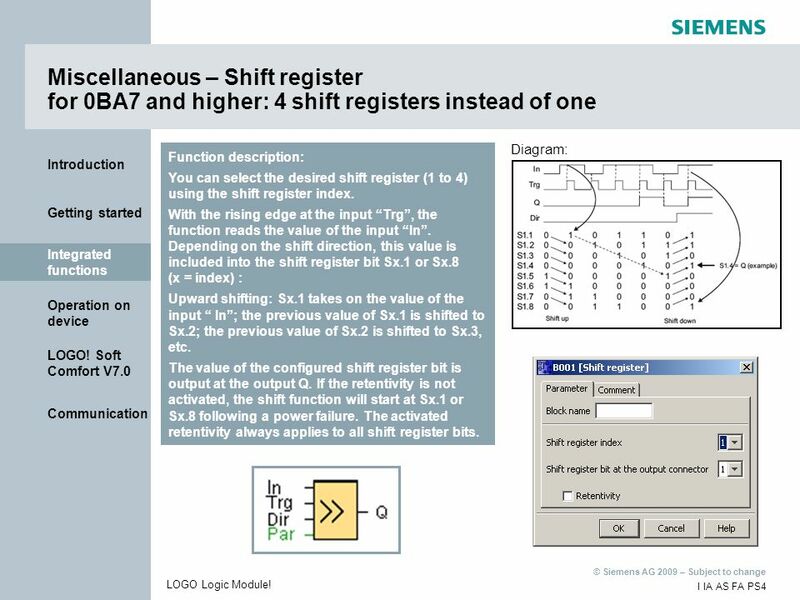 The value of the configured shift register bit is output at the output Q. If the retentivity is not activated, the shift function will start at Sx.1 or Sx.8 following a power failure. The activated retentivity always applies to all shift register bits. Diagram: Integrated functions LOGO Logic Module! The Data Log function allows you to record up to 31 variables. You can record digital/ analog inputs and outputs, flags, and parameters of used functions. A rising edge at the “En” input, triggers the recording of a dataset with time stamp. The data log file is saved as .csv-file in the load memory of the LOGO! 0BA7 or on a SD card. When saving in LOGO!, only one .csv-file with a maximum of 340 datasets is recorded as ring buffer. LOGO! 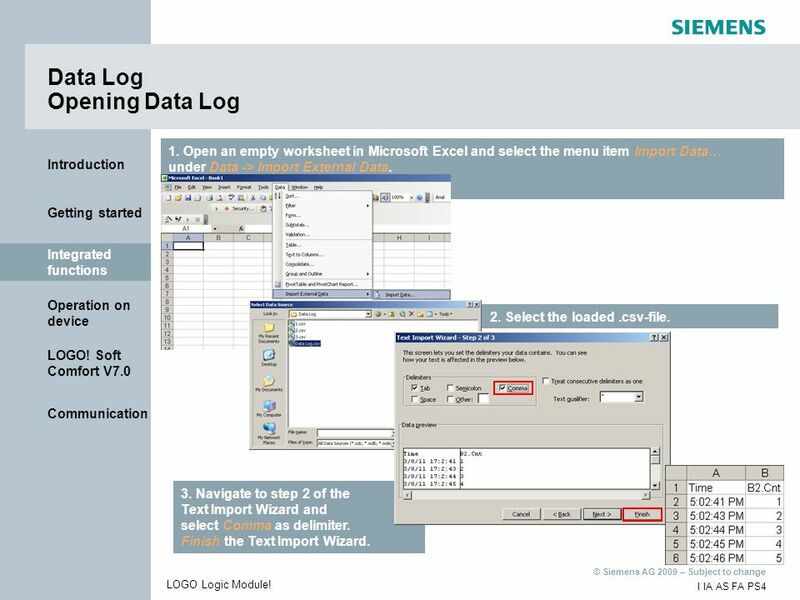 SoftComfort V7.0 enables you to read the data log files and open them using Microsoft Excel. Integrated functions SD card LOGO Logic Module! 1. Create a trigger variable at the input “En”. Integrated functions 2. 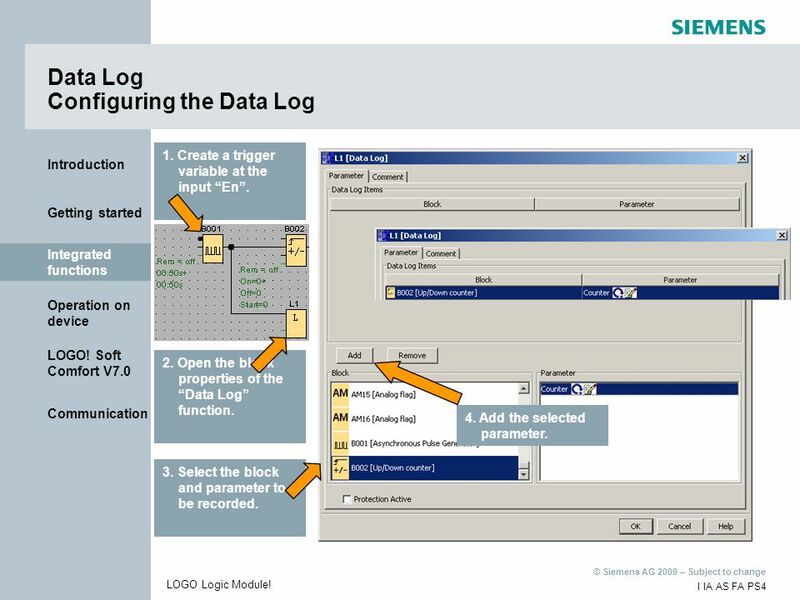 Open the block properties of the “Data Log” function. 4. Add the selected parameter. 3. Select the block and parameter to be recorded. LOGO Logic Module! 1. In LOGO! SoftComfort V7.0, open the Upload Data Log… menu item under Tools -> Transfer. Integrated functions 2. Select the LOGO! 0BA7 to be loaded via the IP address. 3. 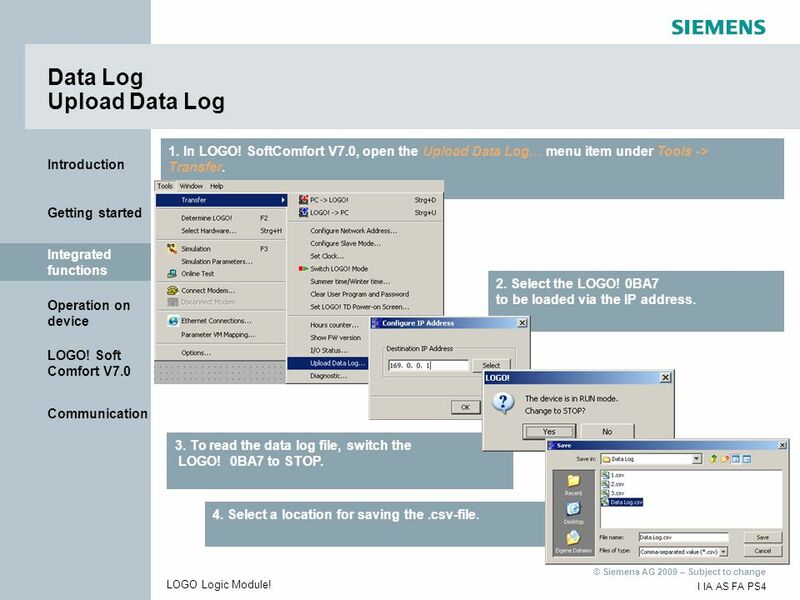 To read the data log file, switch the LOGO! 0BA7 to STOP. 4. Select a location for saving the .csv-file. LOGO Logic Module! 1. Open an empty worksheet in Microsoft Excel and select the menu item Import Data… under Data -> Import External Data. Integrated functions 2. Select the loaded .csv-file. 3. Navigate to step 2 of the Text Import Wizard and select Comma as delimiter. Finish the Text Import Wizard. LOGO Logic Module! 24 UDF Creating a UDF Creating UDFs (User-defined Function blocks) facilitates programming in LOGO! SoftComfort V7.0. You can combine complex function interconnections to a separate function block which you can save and call multiple times in the program. Furthermore, the clarity of the program is much improved. You can create a UDF diagram (UDF) via File -> New. A rectangle then opens in which you can create the desired switching program. Or you select all blocks you want to combine to a UDF in an existing switching program and select Create UDF in the context menu opened by clicking the right mouse button. Integrated functions LOGO Logic Module! 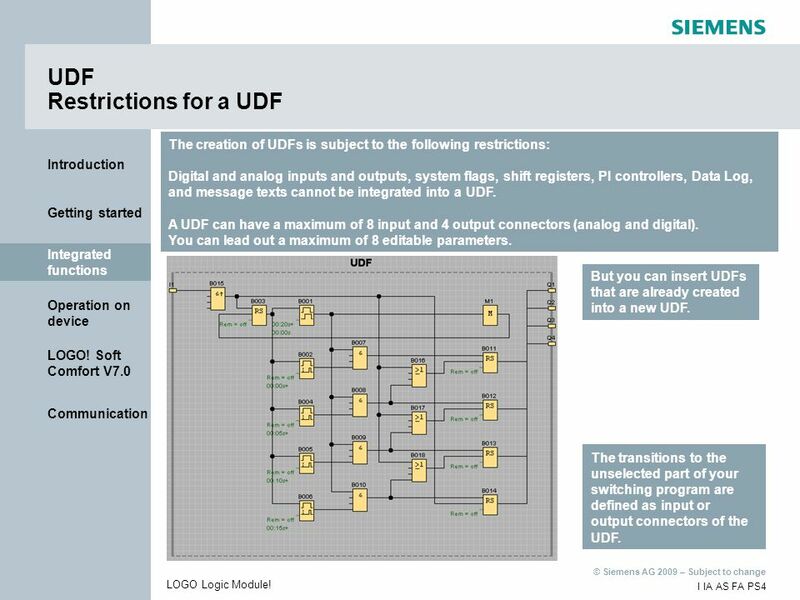 The creation of UDFs is subject to the following restrictions: Digital and analog inputs and outputs, system flags, shift registers, PI controllers, Data Log, and message texts cannot be integrated into a UDF. A UDF can have a maximum of 8 input and 4 output connectors (analog and digital). You can lead out a maximum of 8 editable parameters. 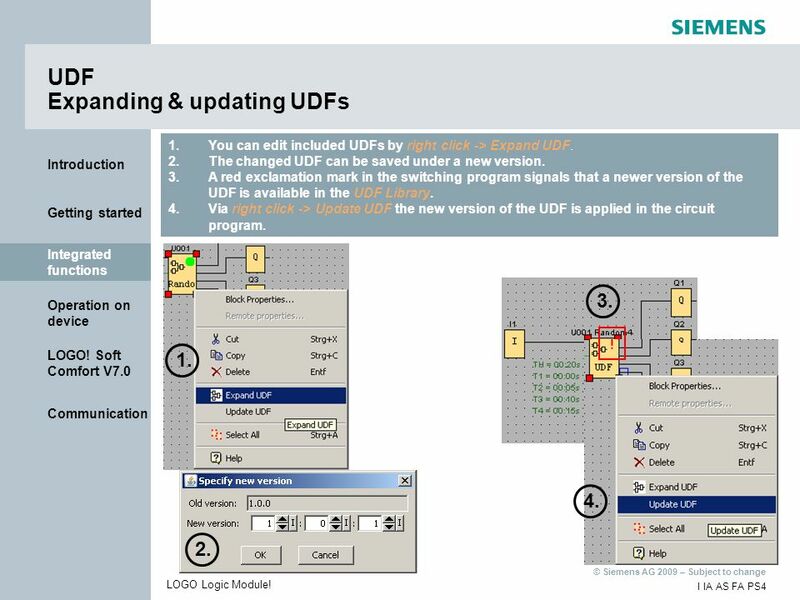 Integrated functions But you can insert UDFs that are already created into a new UDF. The transitions to the unselected part of your switching program are defined as input or output connectors of the UDF. LOGO Logic Module! 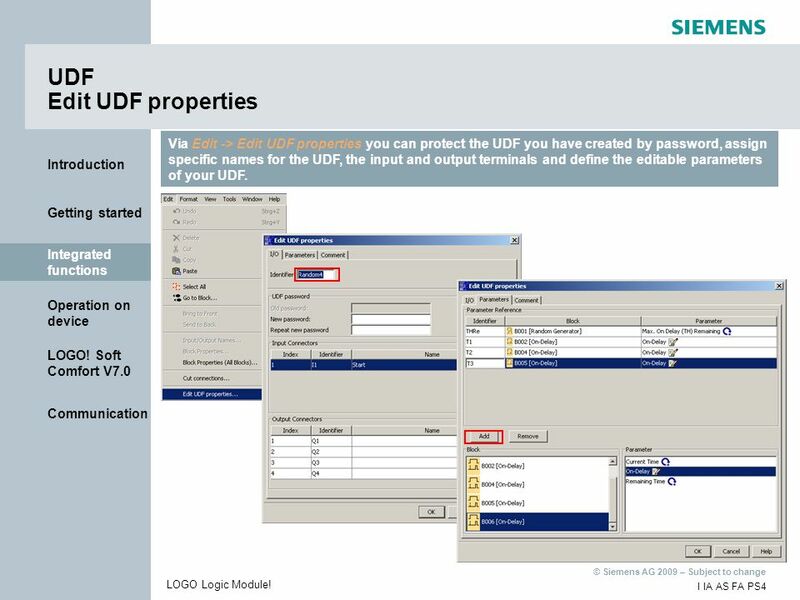 Via Edit -> Edit UDF properties you can protect the UDF you have created by password, assign specific names for the UDF, the input and output terminals and define the editable parameters of your UDF. Integrated functions LOGO Logic Module! 27 UDF Saving UDF You can save your UDF using the icon or via File -> Save as…. The UDF is saved in the lma format. Integrated functions LOGO Logic Module! 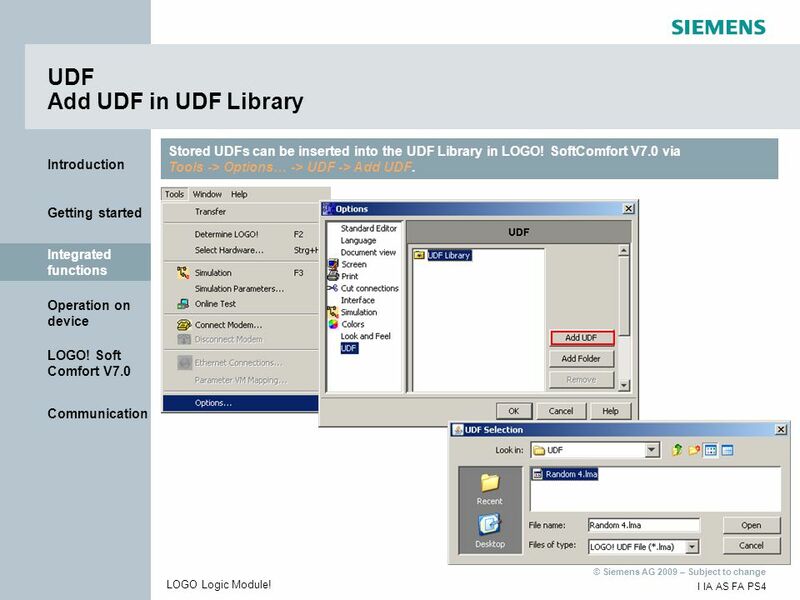 Stored UDFs can be inserted into the UDF Library in LOGO! SoftComfort V7.0 via Tools -> Options… -> UDF -> Add UDF. Integrated functions LOGO Logic Module! The UDFs that have been created and inserted are listed under UDF in the tree structure in LOGO! SoftComfort V7.0. You can use them in the switching program by dragging & dropping. In the Block Properties… you can edit predefined parameters. Integrated functions LOGO Logic Module! You can edit included UDFs by right click -> Expand UDF. The changed UDF can be saved under a new version. A red exclamation mark in the switching program signals that a newer version of the UDF is available in the UDF Library. 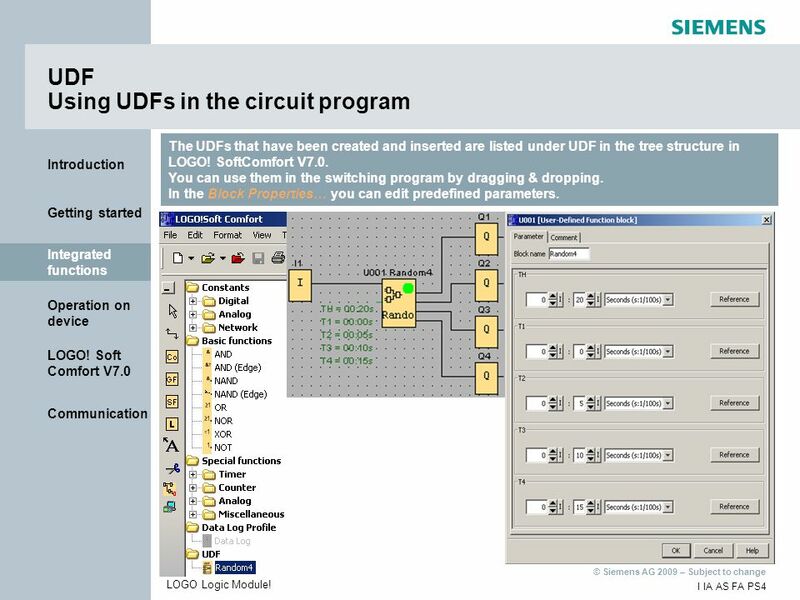 Via right click -> Update UDF the new version of the UDF is applied in the circuit program. Integrated functions 3. 1. 4. 2. LOGO Logic Module! LOGO! 0BA7 and the ES5 version of the LOGO! TD provides the additional start screen option defaults to the parameter assignment menu. LOGO! Mo 09:30 s OK ESC LOGO! Stop Set Param >Set .. Prg Name s OK ESC Beispiel: Text Zweite Ebene Dritte Ebene Vierte Ebene Fünfte Ebene Operation on device LOGO! I : s OK ESC LOGO! Clock .. Contrast >StartScreen s OK ESC LOGO! >Stop Set Param Set .. Prg Name s OK ESC LOGO! Clock Input DI >Menu	* s OK ESC LOGO Logic Module! LOGO!-LOGO! 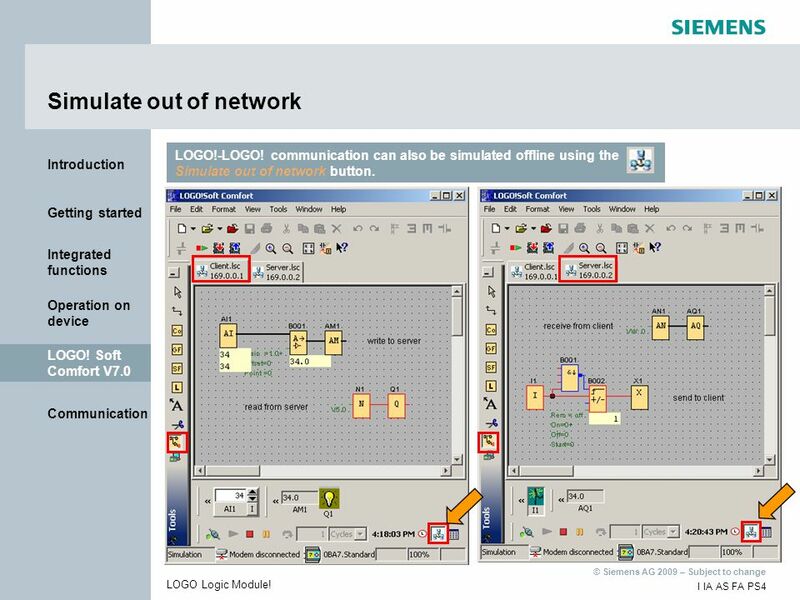 communication can also be simulated offline using the Simulate out of network button. LOGO! Soft Comfort V7.0 LOGO Logic Module! 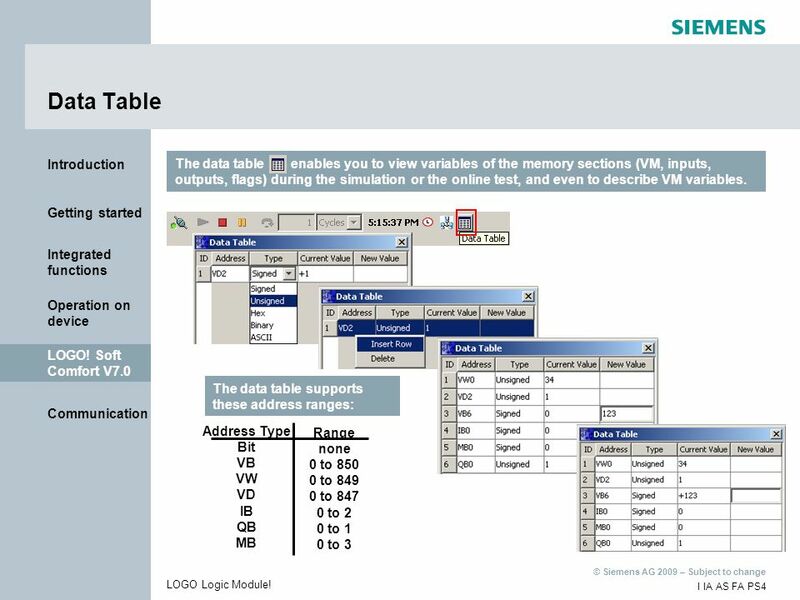 33 Data Table The data table enables you to view variables of the memory sections (VM, inputs, outputs, flags) during the simulation or the online test, and even to describe VM variables. LOGO! Soft Comfort V7.0 The data table supports these address ranges: Address Type Bit VB VW VD IB QB MB Range none 0 to 850 0 to 849 0 to 847 0 to 2 0 to 1 0 to 3 LOGO Logic Module! 34 I/O Status Overview Via Tools -> Transfer -> I/O Status… you can view the development of all inputs and outputs as a function of time. Additionally, you can record log file in .csv-format during activation of the I/O status. LOGO! Soft Comfort V7.0 LOGO Logic Module! 35 Diagnostic Via Tools -> Transfer -> Diagnostic… you can view error messages that have occurred. LOGO! Soft Comfort V7.0 LOGO Logic Module! During master-slave communication, the slave LOGO! 0BA7 acts as extension module without a program of its own. The master describes or reads the digital and analog inputs and outputs of the slave. Each slave can be extended within the maximal extension. Use the network blocks for the master-slave communication. When using these blocks, an Ethernet connection to the slave is created automatically. This connection requires you to specify the module address of the master. Master (IP: ) Communication LOGO Logic Module! For the master-slave communication to work, the communication partner must be switched to slave mode. This can done in LOGO! SoftComfort V7.0 or directly via the menu navigation of LOGO! 0BA7. >Program.. Card.. Setup.. Start Communication >Network.. Diagnostic.. IP address >Set mode Normal * >Slave Password >Config Master IP LOGO Logic Module! During client-server communication, the server provides its data areas for the client to write to or read. A LOGO! 0BA7 can be client and server at the same time. It is defined for each configured connection whether the LOGO! 0BA7 acts as client or server. Double-click on the added connection to open the address configuration. Communication LOGO Logic Module! Define the connection as client or server connection in the respective program. You have to specify the IP address and the TSAP of the communication partner. Client (IP: ) Server (IP: ) Communication LOGO Logic Module! You have to additionally specify the data transfers on the client side. You can define up to 32 data transfers. You can transfer up to 212 bytes in each data transfer. One byte is the smallest amount of data to be transferred. Define the direction (read or write) for each data transfer. Specify the data length to be transmitted in bytes (1 to 212). Specify the local start address byte (0 to 850). Specify the start address byte of the server (0 to 850). Communication The Keep-Alive function serves as connection check. When activated, the connection is checked every 5 seconds. LOGO Logic Module! Depending on the data direction, the parameter VM mapping has to be assigned on the sending side: on the server side when reading from the server on the client side when writing to the server Up to 64 parameters of the special function blocks used in the program circuit can be assigned to the VM area. Select the used special function block from your program. Select the parameter to be transferred (the data type is preset). Determine the start address in the VM area. Communication LOGO Logic Module! 42 LOGO!-LOGO! communication (client – server): Example 1: Writing the analog input of the client in the server Analog input AI1 of the client is to be transmitted to the server and there be output at the analog output AQ1. 1. The analog input is submitted to the special function Analog Amplifier with the gain factor Gain = 1. The output of the analog amplifier Ax, amplified is written to VW 0 through the variable memory configuration. 3. A data transfer to the server with the assignment VW 0 = VW 0 is defined in the client connection. Client Communication Server 4. 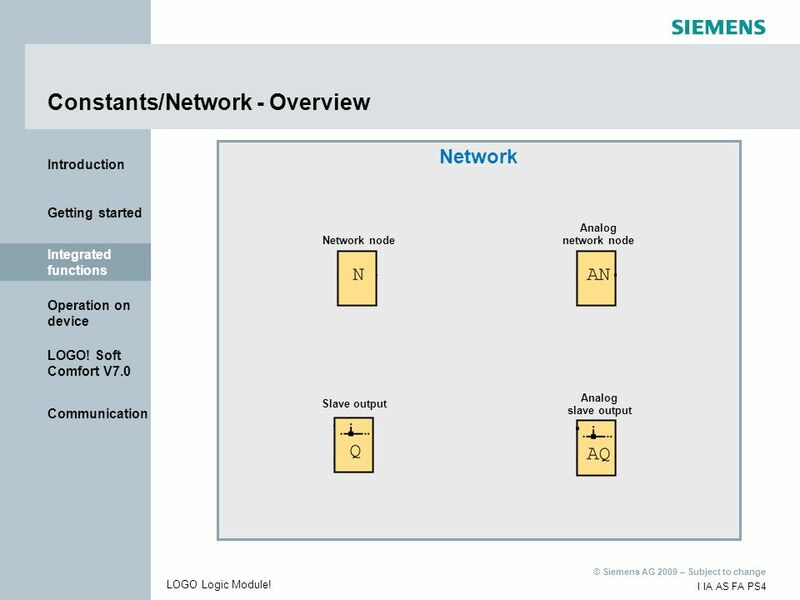 The VW 0 is provided at output AQ1 on the server side using the analog network node. LOGO Logic Module! Input I1 of the server is to be read and its status is to be output at the client‘s Q1 output. 1. Input I1 sets the special function Up/Down counter to 1. Server The counter value Counter is written to VD 2 through the variable memory configuration. Communication Client 3. In the client connection a data transfer from the server is specified with the assignment VD 2 = VD 2. VD2 = VB2 to VB5 4. Using the function Network node the modified bit V5.0 is provided at the output Q1. LOGO Logic Module! The S only offers the server functionality in the firmware V1.x. Consequently, the communication with the S requires a client connection to be configured on the LOGO! 0BA7 side. Client S Server (IP: ) Communication Enter as server TSAP for the S Specify the IP address of the S Access to the S data is accomplished using data blocks. These must not be Symbolic access only. The variables selected for data transfer must be created on the S side. LOGO Logic Module! 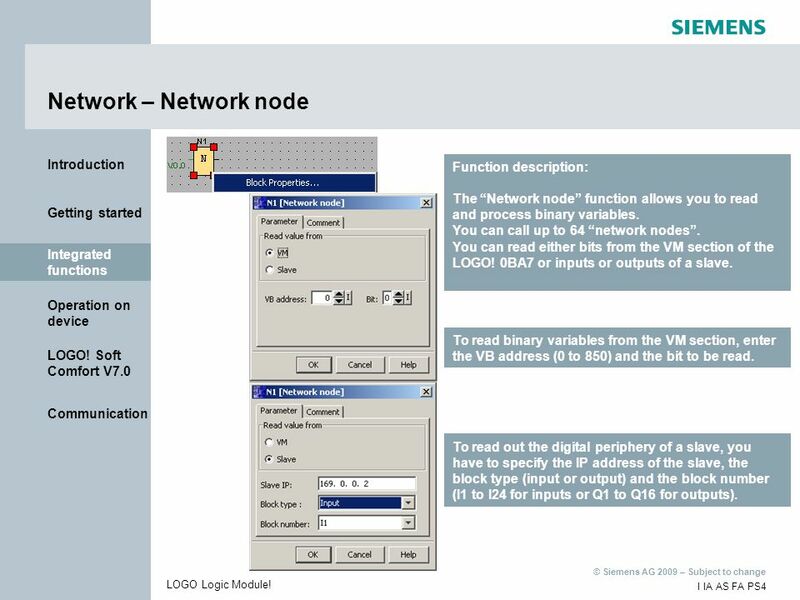 A server connection must be configured when connecting an HMI to the LOGO! 0BA7. Set a checkmark in the box Connect with an Operator Panel (OP). Enter as client TSAP for the HMI. Specify the IP address of the HMI. LOGO! 0BA7 Server (IP: ) HMI Client (IP: ) Communication To configure the HMI, you need WinCC flexible or the TIA Portal V11. 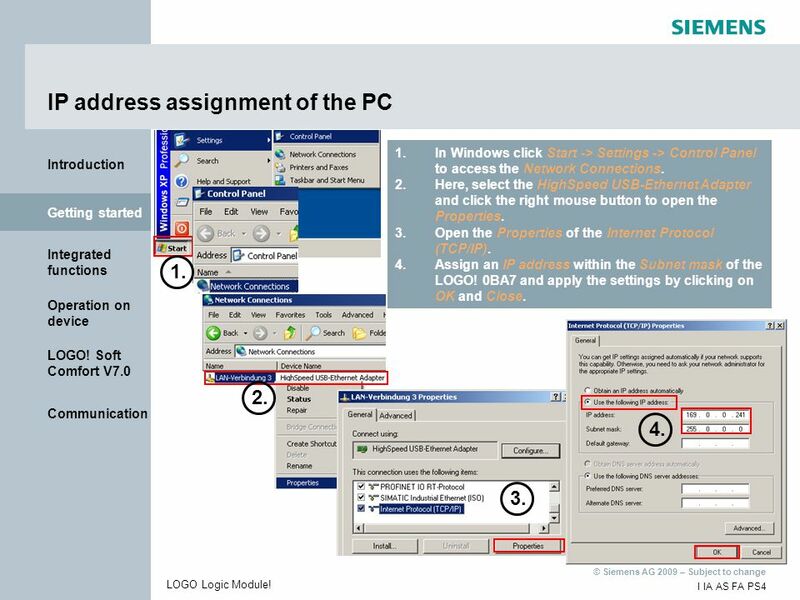 Select the SIMATIC S7 200 communication driver to configure the connection with the LOGO! 0BA7. LOGO Logic Module! Download ppt "Innovative Switching & Control"
Module 3 Configuring Hardware on a Computer Running Windows XP Professional. Copyright © 2005 Rockwell Automation, Inc. All rights reserved. 1 Micro Logix 1100 RSLogix 500 LAB#2 Timing, Counting & Comparing. Inputs: Digital and 4 configurable for Digital or 10 bit Analog Outputs:4 - 8 amp Relays or 700ma Transistors (1 PWM) 4 Line by 18 Character fully. Niobrara R&D Corp Compact PLC Upgrades With the CERI. XP Tutorial 9 New Perspectives on Microsoft Windows XP 1 Microsoft Windows XP Exploring Your Network Tutorial 9. Riso Digital Education Center Appendix for SRC Training Basic Course 1. A+ Guide to Software Managing, Maintaining and Troubleshooting THIRD EDITION Chapter 11 Windows on a Network. SETUP AND CONFIGURATIONS WEBLOGIC SERVER. 1.Weblogic Installation 2.Creating domain through configuration wizard 3.Creating domain using existing template. 1 Chapter 2 ROUTER FUNDAMENTALS By: Tassos Tassou.